Cusco is the ancient capital of the empire of the Incas, a charming city, full of history and legends. Its name in Quechua, is pronounced Qosq’o and translates as navel. And this is the reason why the city of Cusco is known as the “navel of the world”. From this city, they extended, all the roads of the empire of the Incas. Today is the best destination in South America, you can enjoy hundreds of things to do in the city and more if you come with your children (of all ages). The whole city offers great walks and excursions, and each can be a great adventure. It is a great place, fun to explore with kids of all ages, although there is so much more for the older kids than for the younger ones. 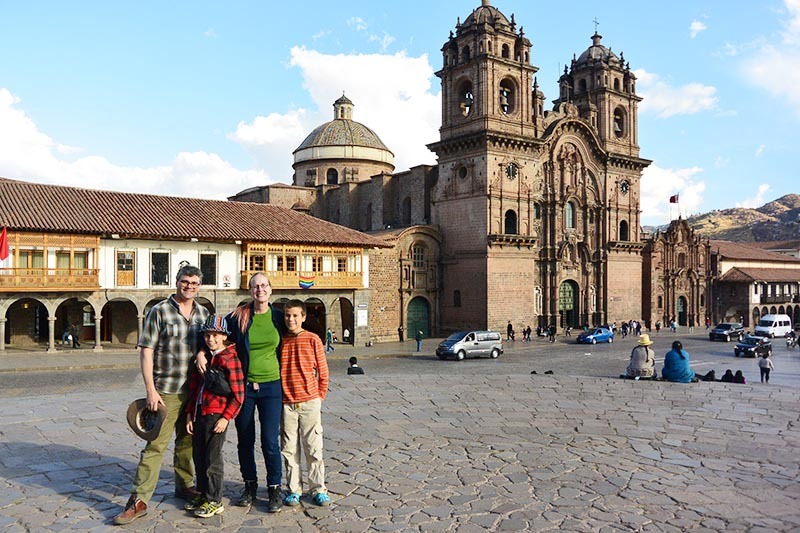 Something that has to be very present is the altitude of Cusco and that its 3,400 meters (11,152ft) can make the concern for the symptoms of altitude sickness very real, but there are ways to avoid it. In contrast, the height of the Sacred Valley of the Incas is 2,400 meters, so it is one of the best places where you can acclimatize, besides being great fun, it has a spectacular climate and a lot of fun things to do, including adventure sports, hiking and horseback riding. The streets of Cusco were made for walking, it is like walking through a gigantic open-air museum, you can go through the center of Cusco without a map and without a guide and yet you will encounter incredible Inca ruins, its streets are narrow and cobbled, people are wonderful, red tile roofs and incredible views. There are many ornate churches and cathedrals in Cusco, but the Cathedral of Cusco is reputed to be the most beautiful in America, was built after 1600 and was built for more than 100 years and houses beautiful works of art, including a painting of the last supper in which Jesus and his disciples enjoy a chinchilla. He can show his children the painting of the last supper, just before entering the cathedral, and teach them that the animal that appears in the last supper of the cathedral is an animal from Peru. Getting a class on how to make chocolate in Cusco’s “Chocomuseo” is one of the best experiences you can have with your children, the class lasts 2 hours and is very fun for children (you can do it with children 8 years old and over). Your children can make their own chocolate, with the ingredients you want, even if you are not part of the shop. It will teach you the little museum of chocolate and the history of this delicious 2000 year old dessert. You can drink a delicious cup of chocolate on the balconies of the chocolate museum, and although we know it may be a lot of chocolate, but with a chocolate cake (delicious), it should be one of the best pleasures of life. The bohemian neighborhood of San Blas is one of the most charming areas of Cusco more if you are coming with your teenagers. You can reach, after climbing a slope that comes from the street where is the stone of the 12 angles. It is the artisan’s neighborhood of Cusco, you can see dozens of artists, workshops and small art galleries, but there are also cafes, it is a great place to walk and get great pictures. You can get a ceramic cow from the workshop of Camilo Vera Vizcarra, an artist who won the UNESCO Prize for Excellence. The incredible San Blas neighborhood has spectacular panoramic views of the city, as well as the oldest church. On the outside, the structure painted white may not be very amazing from the outside, but it is home to an impressive pulpit, carved on a single tree trunk. You can finish the day with a pizza, we recommend you book Peruvian food for breakfast and lunch. 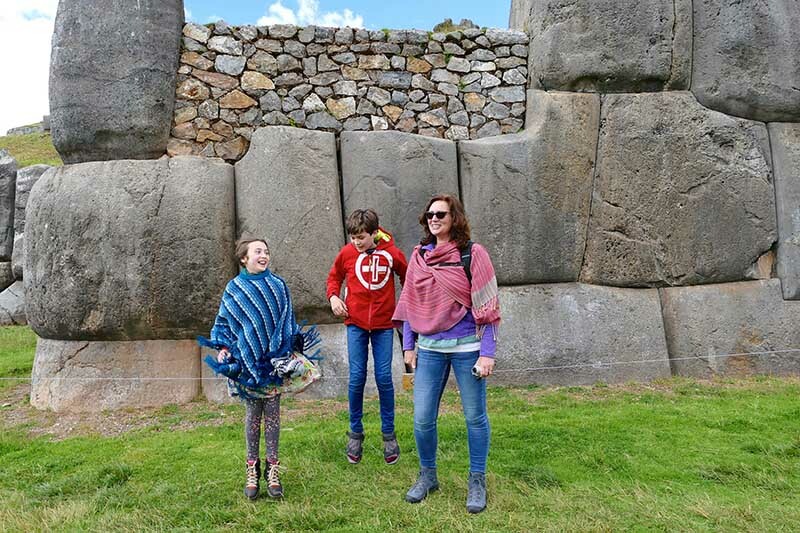 Around the city of Cusco you can find amazing Inca sites: Sacsayhuaman is one of the most mysterious places in the world, its huge armed stones were armed like a huge puzzle. But he is not the only one, Tambomachay, Puca Pucara (or Puka Pukara) and Qenqo. 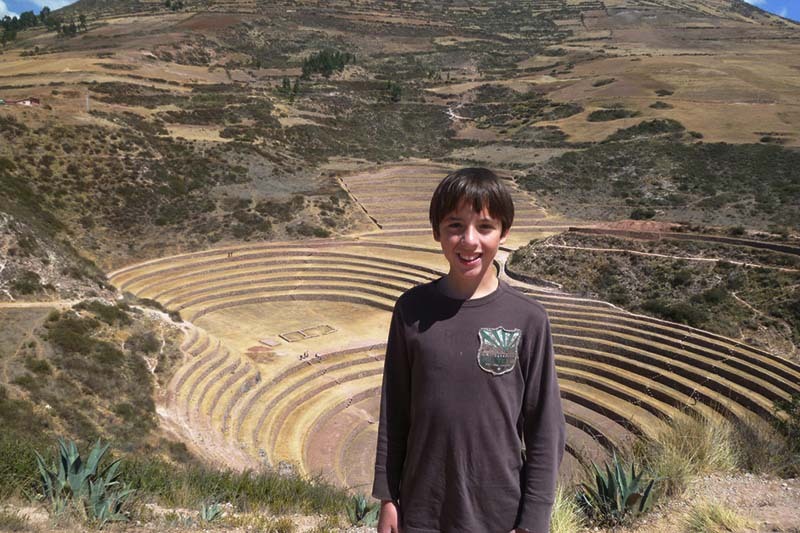 We can take you through these amazing Inca sites, before your trip to Machu Picchu. In case you did not know, you can not wait to be in Cusco to book tickets to enter Machu Picchu because they must be reserved with time in advance. You can do it through info@boletomachupicchu.com. You can do it anywhere in Cusco, but we recommend you take advantage of this warm hug especially when you are in Machu Picchu. But you can go hugging some baby alpacas or small sheep on the way, these animals walk with their owners through the city of Cusco (please do not take a picture without your consent), and it will cost you to take a picture with them. But it is certainly one of the best memories you can get in the city. There is white chicha (of quinoa) for children and chicha de Jora for you (it is a liquor made from corn, since the time of the Incas). But undoubtedly, the most delicious chicha that your children can enjoy is made with purple corn and is called chicha morada, a Peruvian specialty, with corn, pineapple, cinnamon, cloves and sugar. You can find this delicious drink in almost every menu of Peruvian food restaurants. Cusco is home to numerous museums, in addition to the “chocomuseo“. You can visit the Museum of the house Concha; in it are the pieces that were returned by the university of Yale, and that correspond to the excavations of Hiram Bingham, during the discovery of the “lost city of the Incas”. 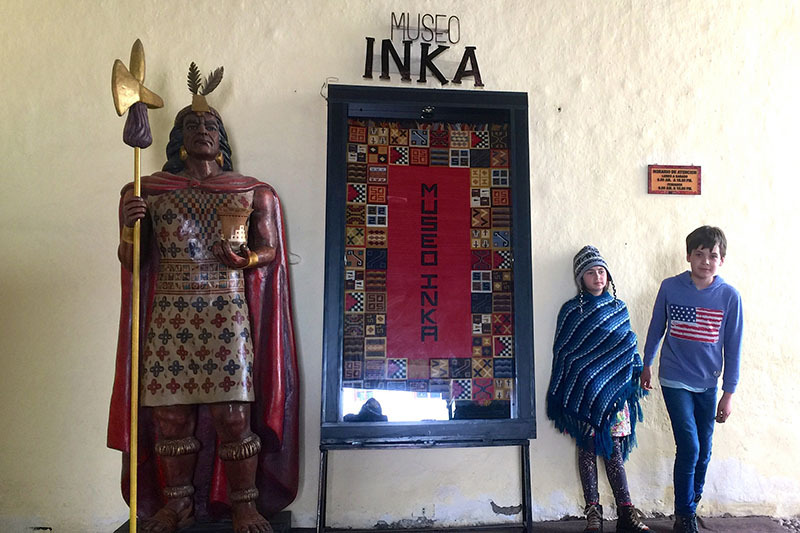 Then you can visit the Inca Museum, home to a large collection of jewelry, ceramics and textiles, but there are also some mummies, which were part of the Inca tradition. Outside the museums, you will find women weavers from the Sacred Valley of the Incas, will offer you some of their work. Some of them will also inform you about the communities in which you can see and learn something of the traditional fabric of Peru. Younger children love to use Andean looms. Another museum you should see is the Pre-Columbian Art Museum, which houses a collection of pre-Columbian art, and you can accompany your younger children to have fun with the flames of the garden. Being with children throughout the day demands a lot of energy and the Belmond Monastery Hotel is one of the most beautiful places in town to take a break. It is a luxury hotel in the heart of Cusco. You can see the hotel’s incredible private collection, order a cup of coffee and play a game of chess with pieces of stone with Inca motifs. Peru is the best culinary destination and Cusco, one of the best places to have an authentic culinary experience, but not only with Peruvian food but also with typical food of the city. One of the best things you can do in Cusco is to eat guinea pigs (baked guinea pig). If you lack sugar, you can drink a delicious “soda” (yellow) called Inka Kola. The market of San Pedro is one of the great places where you can try many of the traditional meals of Cusco. In Cusco you can try many delicious meals, but you will also find restaurants of foreign, Italian, Chinese, Mexican food. And the fusions of these with ingredients and Peruvian dishes. Cusco is a great place to shop with children, you can carry many souvenirs and choose from hundreds of products, including handicrafts, hand knits, clothing, silver jewelry, wood carvings and others. You can start at the Main Square, and wander around the surrounding streets. You can see the same products that you can find in the main craft centers of Cusco and get them for 70% of the price you saw in those stores. 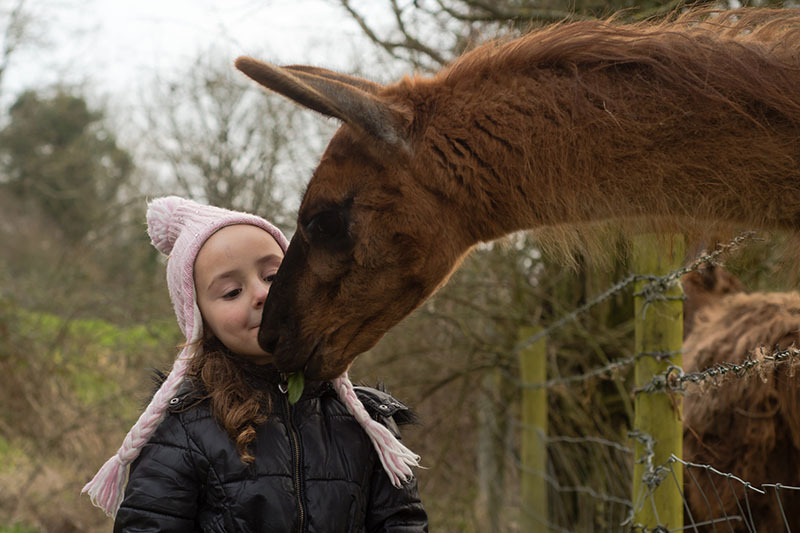 It could contribute, if it is of the people who wish to have a sustainable trip, buying the products directly from the producers of these garments; in their majority, of alpaca wool.